Statues of Ksitigarbha can be found throughout Japan, especially in cemeteries, since he is believed to be the protector of people condemned to Hell. He is also associated with stillborn, miscarried, and aborted fetuses who, in Japanese tradition, receive Divine punishment for bringing grief to their parents. He is also the protective deity of travellers, and roadside statues of Jizo are a common sight in Japan. As Ti Tsang (Di Zang) he is also quite popular in Taiwan (where he is often appealed to for protection against earthquakes), Hong Kong, with Overseas Chinese and increasingly on the Chinese mainland. His images are usually found in the memorial halls of Buddhist temples. The history of Ksitigarbha is well described in the Sutra of The Great Vows of Ksitigarbha Bodhisattva, one of the most popular Mahayana Buddhist sutras. This sutra was spoken by the Buddha towards the end of his life to the beings of the Trayastrimsa Heaven as a mark of gratitude and remembrance for his beloved mother, Queen Maya. It stated that Ksitigarbha practiced filial piety as a mortal, which eventually led to making great vows to save all sentient beings. In the Ksitigarbha Sutra, the Buddha revealed that in the distant past aeons, Ksitigarbha was a Brahman maiden by the name of Sacred Girl. She was deeply troubled when her mother died, because she had often been slanderous towards the Triple Gem. To save her from the great tortures of hell, the young girl sold whatever she had and used the money to buy offerings which she offered daily to the Buddha of her time, known as The Buddha of Flower of Meditation and Enlightenment. She made fervent prayers that her mother be spared of the pains of hell and requested the Buddha for help. One day at the temple, while she was pleading for help, she heard the voice of the Buddha advising her to go home immediately and there to sit down and recite his name if she wanted to know where her mother was. She did as she was told and while doing so, her consciousness was transported to a Hell Realm where she met a guardian who informed her that through her fervent prayers and pious offerings, her mother had accumulated much merits and therefore, she had already been released from hell and ascended to heaven. She was greatly relieved and should have been extremely happy, but the sights of the great sufferings in Hell that she had witnessed so touched her tender heart that she made a vow to do her very best to relieve beings of their sufferings forever in her future lives of kalpas to come. There is a legend talking about how Ksitigarbha was supposedly seen in China. In Tung Han, during the reign of the Ming Emperor, Buddhism started to flourish, reaching its climax in the era of the Tang Dynasty, eventually spreading influence to Japan and Korea. At the time, monks and scholars arrived from those countries to seek the Dharma in China. One of these pilgrims was a prince of Korea, which was divided into three countries (Sin Lo, Banjuli and Pai Chi). Kim Chiau Jue was a prince from Sin Lo who became a monastic under the name of Earth Store (Dizang). He came to the region of Anwei to Mount Jiuhua. After ascending, he decided to build a hut in a deep mountain area so that he may be able to cultivate. According to records, the Bhikshu was bitten by a poisonous snake, but did not move, thus letting the snake go. A woman happened to pass by and gave the Bhikshu medicines to cure him of the venom, as well as a spring on her son’s behalf. For a few years, the Bhikshu continued to meditate in his hut, until one day, an scholar named Chu-Ke led a group of friends and family to visit the mountain. Noticing the Bhikshu meditating in the hut, they went and took a look at his condition. They had noticed that the Bhikshu’s bowl did not contain any food, and that his hair had grown back. Feeling pity on the Bhikshu, Scholar Chu decided to build a temple as an offering to the monk. The whole group descended the mountain immediately to discuss plans to build the temple. Mount Jiuhua was also property of a wealthy person named the elder Wen-Ke, who obliged to build a temple on his mountain. Therefore, Wen-Ke and the group ascended the mountain once more and asked the Bhikshu how much land he needed. The Bhikshu replied that he needed a piece of land that could be covered fully by his kasaya. Bewildered that a piece of sash could not be enough land to build a temple, the Bhikshu surprised them as he threw the kasaya in the air, and the robe expanded in size, covering the entire mountain! Elder Wen-Ke had then decided to renounce the entire mountain to the Bhikshu, and became the Bhikshu’s protector. Sometime later, Wen-Ke’s son also left the home life to start his life as a Bhikshu. The Bhikshu lived in Mount Jiuhua for seventy five years before passing away at the age of ninety-nine. Three years after his nirvana, his tomb was opened, only to reveal that the body had not decayed. The body may still be viewed today at the monastery he built on Mount Jiuhua. Because the Bhikshu led his wayplace with much difficulty, most people had the intuition to believe that he was indeed the transformation body of Ksitigarbha. In Buddhist iconography, Ksitigarbha is typically depicted with a shaven head, dressed in a monk’s simple robes (unlike most other bodhisattvas, who are dressed like Indian royalty). In his left hand, Ksitigarbha holds the wish-granting jewel Cintamani; in his right hand, he holds a monk’s staff called a shakujo in Japanese (jingle staff), which is used to alert insects and small animals of his approach, so that he will not accidentally harm them. Such a staff is traditionally carried by high ranking monks of Chinese Buddhist temples. Usually, Ksitigarbha will sometimes be seen wearing a crown depicting the Five Dhyani Buddhas, worn by Tibetan and Chinese monks in Tantric rituals. In Japan, Ksitigarbha is almost always depicted in a standing position; the posture of the adjacent picture is rather unusual. Like other Bodhisattvas, Ksitigarbha usually is seen standing upon a lotus base, symbolizing his release from the karmic wheel of rebirth. Ksitigarbha’s face and head are also idealized, featuring the third eye, elongated ears and the other standard attributes of an enlightened being. It should be made clear that Ksitigarbha is not the judge of Hell, Yama, which many uninformed Buddhists, Taoists, and those who believe in Chinese folk religion, see Ksitigarbha as. 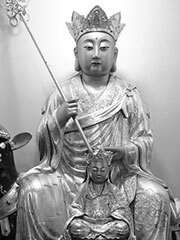 Ksitigarbha has also often been mistaken by many uninformed Buddhists to be Xuanzang, the famous Tripitaka master of the Tang Dynasty who made the hazardous journey to the west to seek the Buddhist scriptures, and the basis for the fictional character from the Chinese novel Journey to the West. This is mainly due to the robe and the Five Buddha crown which both are seen to wear. In Japan, statues of Ksitigarbha are often adorned with small red caps and bibs, often made and donated by bereaved mothers. This practice may have been adopted by the Maneki Neko. Ksitigarbha’s features are also commonly made more babylike in order to resemble the children he protects. Ksitigarbha has a twin known as Akasagarbha (虛空藏 ;Ch. Xūkōngzàng, Jap. Kokuzo), the «Void Store». While theologically equally important, Akasagarbha entirely lacks the popular cult of Ksitigarbha.